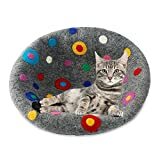 If you feel like pampering your furry little feline friend with their own pet furniture, then skip the usual hideous carpeted cat trees and go for a more sculptural piece that looks more like modern art with these cool new Drop - Wooly Cat Caves. These whimsical cozy cat beds are handmade in Italy from 100% Tyrolean wool that is hand-felted with water and olive oil soap and then shaped into surreal water drop shapes. They make the perfect adorable little lairs for cats to snooze the day away or plot out devastating sneak attacks on their human prey. 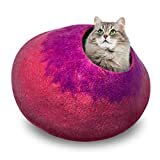 Available in various sizes and colors depending on your pampered cat's interior design preferences.